DePetro.com: DePetro returns to radio: "We will make Rhode Island afternoon radio great again." DePetro returns to radio: "We will make Rhode Island afternoon radio great again." John DePetro Show. Weekdays 1:00-5:00 p.m. on 1540 AM WADK. Online at www.WADK.com. -New afternoon show 1:00-5:00 p.m. weekdays live and local on 1540 AM WADK. -Broadcasting from the right side of the issues on the right side of the AM radio dial at 1540. - The John DePetro Show will always be entertaining, fearless, opinionated, edgy, no holds barred. The Independent Man. -DePetro now the exclusive owner of the John DePetro Show, full ownership of the content of the show, and the freedom in the future to syndicate. -Live each weekday from 1:00-5:pm on 1540 AM WADK, and replayed each night at 10:pm. on WADK and WADK.com. -Listen free Online at WADK.com. -Listen free on popular App "TuneIn Radio." -Each show will be podcast and available on demand 24/7 at WADK.com. 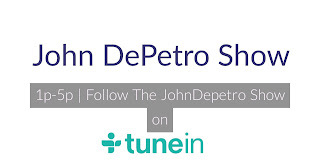 -Follow on Facebook at John DePetro-Radio, Follow on twitter @JohnDePetroshow. Follow on Instagram at John DePetro Show. -The show will be totally unstoppable, protected by God. I proudly announce I return to the Rhode Island airwaves starting Wednesday, January 25, 2017, taking your phone calls weekdays live from 1:00-5:00 p.m. on 1540 AM WADK. Together, we will make Rhode Island afternoon radio great again. The John DePetro Show will be broadcasting from the right side of the issues , on the right side of the dial at 1540 AM. I am also pleased to announce I am now the exclusive owner of the John DePetro Show, which gives me full ownership of the content of the show and the freedom in the future to syndicate my popular, highly-rated, entertaining program. My listeners should get ready for the most entertaining radio I have ever done, and I will continue to tell it like it is. As a genius once told me, "content is King." The John DePetro Show will be totally unstoppable, protected by God. 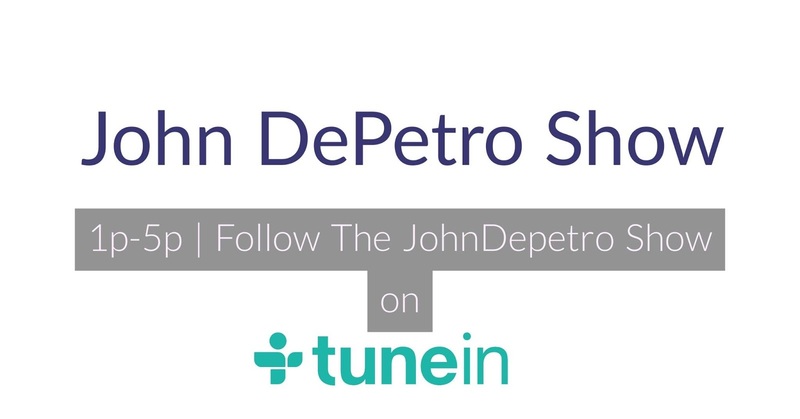 People can listen each day to the John DePetro Show live from 1:00-5:00 p.m.
1. 1540 AM on your radio dial live each weekday. 2. Listen free online at WADK.com live in crystal clear audio. 3. WADK can also be heard free on the popular "TuneIn Radio" App, which can be used on a cell phone, iPad or computer. 4. Each show will be podcast and available on demand 24/7 on WADK.com. 5. The show will be replayed each night at 10:00 p.m. on 1540 AM WADK and WADK.com. With innovative new technology, anyone who wants to listen (and call in ) will be able to, anywhere in the state, anywhere in the country , and anywhere in the world. President Trump will be able to proudly listen to the John DePetro Show from the White House. Under my watch, Rhode Island will no longer be a sanctuary state for illegal aliens. I will continue my vigilance of shining a bright light on local public corruption. My listeners should also know, I have no intention of "cozying up" to the incompetent, crooked state politicians who have run our beautiful state into the ground. On Saturdays, 1540 AM WADK will broadcast a 2 hour John DePetro Show Week in Review. Listeners can now enjoy 42 hours a week of the John DePetro radio show, on 1540 AM WADK, and WADK.com. There will be a live link to the show on www.depetro.com, and the show never ends on Twitter. I look forward to speaking to all the people of our state, and the various callers, including Ann from Cranston, Raymond the illegal and Henry B. Chafee. The John DePetro Show will always be "up down, always round , you know that." I am also happy to be reunited with the tremendous resources, correspondents, and friends at ABC news radio, with WADK being an ABC news affiliate. I am thrilled to be working with my friend and colleague of many years, Bonnie Gomes, the President of 3G Broadcasting. "John DePetro and I have known each other since the late 80's, when we worked together at a Providence radio group. John has a well-known entertaining program, and it matched with our goal of making 1540 AM WADK completely live and local. We are excited to welcome John to our broadcasting family and know that he will bring a new, exciting, entertaining twist to our current programming line-up."